Using your phone might be a better way to control Sling’s occasionally clunky interface. Chromecast users shouldn’t have to wait too much longer to watch Sling TV on the big screen. In an interview with Decider.com, Sling TV CEO Roger Lynch said the company is working on a Chromecast support. “That’s one we intend to launch this year,” he said. Sling TV is a $20 per month service that offers more than 20 live streaming cable channels, including ESPN, TNT, AMC, and CNN. Some channels also offer a selection of on-demand video, and some allow you to watch several days of past programming. Add-on packages with themes like “Sports” and “Kids” are available for $5 per month, and you can tack on HBO for $15 per month. 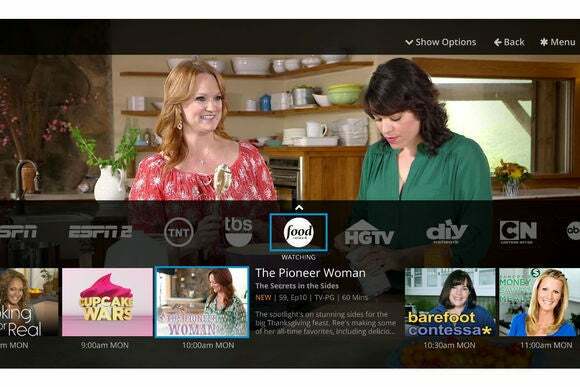 The service first launched on iOS, Android, Mac, PC, and Roku media streamers, and has since landed on Android TV devices, Amazon Fire tablets, Fire TV devices, and Xbox One. While Sling’s help site acknowledges the absence of Apple TV and Chromecast support, it only offers a boilerplate response about always looking to support new platforms. Lynch told Decider.com that Sling TV would also like to support Apple TV, but currently there’s no API that all app makers can use. That’s expected to change with the next version of Apple TV, which should be announced at a press event next week. “If Apple makes an API available and has reasonable business terms, we’d certainly be happy to be on Apple TV,” Lynch said. Why this matters: Chromecast support would be a boon to users of both the $35 TV dongle and more expensive Android TV devices, which have the same Google Cast functionality as Chromecast itself. Sling’s interface—which arranges all channels in a horizontal strip of tiles—can be cumbersome to navigate with a standard remote control, especially if you have more than just the basic bundle. Being able to swipe through those channels on a phone or tablet and beam them to the big screen could make the viewing experience much more tolerable.